The success of denture prostheses is related to many factors. These include technical procedures, functional factors, esthetics, biologic determinants and psychological factors. Psychological factors include the preparedness of the patients and their mental attitudes towards dentures, their relationship with and attitude toward the dentist, their intelligence and ability to learn how to use the dentures and their personalities. Prosthodontists must fully understand their patients because such understanding predisposes the patients to accept the kind of treatment they need. De Van stated, "Meet the mind of the patient before meeting the mouth of the patient". Hence, it is clear that the patient's attitudes and opinions can influence the outcome of the treatment. An individual needs order and meaning in his life, he dislikes ambiguity or lack of structure. He also seeks explanations which, whether accurate or not, provide a sense of order, control and potential prediction. Man does not always act in a rational manner but he does seek to prove to himself and others that his motives and actions are rational because to face the fact that his behavior is irrational arouses anxiety. An individual needs to feel adequate and competent; he becomes confused and disorganized if he sees his adjustive resources as inadequate to cope with any life situation. An individual needs security; he strives to maintain conditions which assure the gratification of his needs. An individual needs social approval-a sense of belonging and status. He tries to become an approved member of the group with which he wishes to identify. An individual needs love and romance. An individual needs self-enhancement and growth. In many modern societies, man's basic (biologic) needs are usually satisfied; therefore he turns his energy to meeting his social and psychological needs and thus strives to actualize his full potentialities. A patient's satisfaction is strongly related to his personality and to his relationship with the dentist. Philosophical patients anticipate the need for treatment with dentures and are willing to rely on the dentist's advice for diagnosis and treatment. These patients will follow the dentist's advice when advised to replace their dentures. Exacting patients are usually in poor health and need a great deal of treatment, but they are unwilling to accommodate suggestions from the dentist or physician to extract hopeless teeth and become denture wearers. Exacting patients also doubt the dentist's ability to make dentures that would satisfy their esthetic and functional needs. Often, the exacting patient demands extraordinary efforts and guarantees of treatment outcome at no additional cost. Hysterical patients are neglectful of their oral health, dentophobic and unwilling to try to adapt to wearing dentures. Although these patients may try to wear dentures, they often fail to use the prosthesis because they expect it to look and function like natural teeth. Indifferent patients tend not to care about their self-image and are not motivated to enjoy eating. They have managed to survive without wearing dentures. Following in House's path, O'Shea et al. and Winkler described ideal dental patients. Realizes the need for the prosthetic treatment. Attempts to use the prosthesis. This patient corresponds to House's philosophical mind patient. TOLBUDS: Patients who could tolerate prosthesis backwards, upside down or sideways. TOLAD: Patients who could tolerate prosthesis with some degree of adjustment. TOLN: Patients who could tolerate nothing. Alex Koper described the "Difficult Denture Bird" as a problem denture patient with much experience as a recipient of various kinds of dental therapy. The problem denture patients are individuals who complain, have pain and are hostile, tense, anxious and unhappy people. They often exhibit regressive behavior and transfer many of their fears and frustrations to the mouth and face and endow their dentist with all sorts of unrealistic fantasies: he / she is an angel, a devil, a magician; he can be kind or cruel. 1. Shaking hands with a patient is an informative process  [Figure - 1]. The dead-fish handshake certainly might indicate a noncooperative patient without too much interest. The vice-like grip could mean a patient who is insecure and trying to impress the dentist with how well he could use the dentures or one who will concentrate on trying to prove that the dentist could not do a job good enough for him. The patient offering a normal, firm handshake would probably be the easiest to g et al ong with. 2. The manner in which the patient opens his month is an indication of his attitude towards dental treatment  [Figure - 2]. 6. Remember names and faces. 7. Be interested in others. The term "psychosomatic" implies the dual character of the disease, wherein the patient's mind-his psyche, determines the character of the disease of the body. The link between the mind and the body in psychosomatic disorders can be observed in the visceral systems as a function of the changes in the emotional state of the patient. The most common disorders, which affect prosthodontic treatment are: (1) circulatory disturbances, (2) respiratory disorders and (3) gastrointestinal disorders. Changes in the function of the circulatory system are among the most common of the physiological effects of emotion. The common problems of hypertension, vasomotor instability and cardiac disease create functional difficulties in mastering a high level of performance in denture function. However, there are also nutritional deficiencies when circulation to the mucous membrane is altered during an emotional disturbance. The poor circulation provides poor resistance to abrasion with resultant ulceration of the mucous membrane, which is in contact with the dentures. A common physical complaint in psychosomatic patients is shortness of breath or difficulty in breathing. Respiratory changes are a prominent feature in intense emotional states. Frequently, asthmatic attacks are encountered. The manipulative procedure during making impressions and jaw recordings during the fabrication of denture prostheses frequently causes shortness of breath, gagging and retching. Patients who gag readily must be firmly but sensitively treated for generally the clinical problems associated with gagging are essentially psychological in character. Every effort must be made to allow easy and comfortable breathing during treatment. Attention must thus be directed to providing a patent airway by good chair posture, by bringing the head forward so that gravity carries salivary fluids and impression materials forward out of the mouth and by firm, sympathetic management. Patients should be directed to breathe slowly and deeply and with a regular rhythm. Poor hygiene frequently is associated with psychoneuroses and causes interference with circulation and antibody formation in the saliva. Faulty diet is frequently nondetergent in character and coupled with poor masticatory efficiencies and promotes and hastens bacterial growth. Patients who are in a depressed state do not maintain good oral hygiene and they may allow masses of debris to accumulate in the buccal folds and on denture surfaces. Numerous habits such as pencil-biting, nail-biting, lip-biting, cheek-biting, tongue-thrusting, tooth-tapping, tooth-clenching and grinding are associated with neuroses and frequently cause rapid changes in alveolar bone, ulceration of the epithelium and very frequently, ill-defined pain. Some patients very frequently eat unduly seasoned food because of cultural habits. Other patients may have a poor selection of diet either by choice, because a good diet is not available or because they have poor masticatory function. Patients under tension frequently ingest large amounts of candies, cakes, alcoholic beverages and frequently smoke excessively. These excesses inhibit ingestion of a good diet, which is essential for the maintenance of healthy mucosa and alveolar bone. Those associated with abnormal physical changes in organs innervated by the autonomic nervous system (for example, peptic and duodenal ulcers and hypertension). Those influenced by environmental events that possess psychological significance (for example; musculoskeletal or sensory anomalies and hypochondriacal complaints such as chronic pain syndrome). 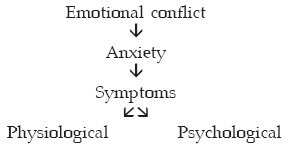 Variation in individual reaction to stressful events. Pathological conditions associated with environmental stressors of a general nature. Temporomandibular joint (TMJ) dysfunction may be a pathologic condition associated with environmental learning. Treatment of stress reactions requires modulation of the effects of stress and includes relaxation, cognitive restructuring and environmental modification. Conditions that arise as a result of classic conditioning. The gag reflex may arise from classic conditioning. Classically conditioned symptoms are usually treated by extinction procedures such as desensitization and flooding. Operantly conditioned symptoms-Denture intolerance may be an operantly conditioned symptom. Operantly conditioned symptoms are alleviated by discontinuing the reinforcement that maintains them. With age, we also experience more problems in handling a large amount of new information at one time. Learning requires more time and the information needs to be repeated to be learned. Thus, learning is hampered when information is presented rapidly, exposed briefly and interrupted frequently. Older patients can certainly learn new techniques in preventive dentistry and home care. They should be fully informed about the treatment plan proposed by the dentist. But, based on the description of cognitive changes with aging described above, the dental team might benefit from some of the recommendations listed below. This will reduce the problems of patient dissatisfaction, noncompliance and potential frustration due to misunderstandings between the dental team and their aged patients. Discuss examination findings and treatment recommendations in a quiet, relaxing setting with no background noise. The dentist's office is a much better setting for such discussions than the operatory. Structure the message so that it is presented chronologically or in a step-by-step manner. For example, ("Remove your dentures at night, brush them with nonabrasive toothpaste and a medium brush, place the dentures in a cup of tepid water overnight and rinse your mouth."). Dental treatment planning may be explained best by procedure and sequence (for example, "We will first extract teeth numbers 14 and 15. After this area has healed, we will design a partial denture to replace these teeth). This can be accompanied by a calendar of appointments and what the patient can expect in the interim. Take more time to listen to the complaints of older patients, to discuss dental procedures and even to repeat the message. It is essential to allow more time to explain dental procedures to aged patients. This should include time for clarifying technical terms (note that this often includes such common place dental terms as denture, mandible and periodontal disease for this generation of patients), for allowing the patient to ask questions at each step and even for asking the patient to recount specific points. Although the method of active inquiry has proven successful in the classroom, it is unfortunately underused in the dental care setting. Do not present too much information at once. In an attempt to reduce information overload, the dental team must avoid the tendency to give all home care instructions and procedures at one visit. The older person has a greater chance of retaining the information in secondary memory if the technique of successive approximations is used. With this approach, one could explain in one visit procedures for home care of dentures, followed by a description of caring for natural teeth at the next visit. At a subsequent visit, one could review dietary habits and counsel the patient on nutritional deficiencies. Similarly, rather than describing the complete treatment plan at once, the dentist could explain each stage just before it is undertaken. Finally, it helps to use multiple modes of communication. Information presented in a written format and reviewed orally by the dentist with the patient is retained longer than talking to patients or giving them a written message to read "when you get home". Instead of an appointment card, the patient could be given a calendar for the month with scheduled appointments highlighted on the calendar. In addition to words, symbols to represent the type of appointment (for example, a denture to represent an appointment for a denture adjustment; a toothbrush to symbolize a cleaning appointment) could be used. This approach is also useful for alleviating the problem of reduced information retention due to visual and auditory decline. Dentists must have a sense of real concern for the health, comfort and welfare of the patients to establish necessary mutual confidence. A "tender loving care" approach towards dental patients should be taken before treatment is started and continued throughout the treatment planning and the treatment itself. We can help patients with psychological problems by acquiring respect for the individual concern and understanding. Seifert I, Langer A, Michmann J. Evaluation of psychologic factors in geriatric denture patients. J Prosthet Dent 1962;12:516-23. Bliss CH. Psychologic factors involved in presenting denture service. J Prosthet Dent 1951;1:49-63. Grieder A. Psychologic aspects of prosthodontics. J Prosthet Dent 1973;30:736-44. Gamer S, Tuch R, Garcia LT. MM House mental classification revisited: Intersection of particular patient types and particular dentist's needs. J Prosthet Dent 2003;89:297-302. Kotwal KR. Beyond classification of behaviour types. J Prosthet Dent 1984;52:874-6. Koper A. Difficult denture birds: New sightings. J Prosthet Dent 1988;60:70-4. Friedman N, Landesman HM, Wexler M. The influences of fear, anxiety and depression on the patient's adaptive response to complete dentures. Part 3. J Prosthet Dent 1988;59:169-73. Brewer AA. Treating complete denture patients. J Prosthet Dent 1964;14:1015-30. Silverman SI. The psychologic considerations in denture prosthesis. J Prosthet Dent 1958;8:582-90. Eldon D. Bills Counsel to the aging dental patient. J Prosthet Dent 1999;80:81-8. Newton AV. The psychosomatic component in prosthodontics. J Prosthet Dent 1984;52:871-4. Kelly HT. Psychomatic aspect of prosthodontics. J Prosthet Dent 1955;5:609-22. Kiyak HA, Mulligan K. Studies of the relationship between oral health and psychological well-being. Gerodontics 1987;3:109-12. Collett HA, Briggs DL. Some psychosomatic considerations in prosthetic dentistry. J Prosthet Dent 1955;5:361-7. Sondell K, Soderfeldt B, Palmqvist S. Dentist-patient communication and patient satisfaction in prosthetic dentistry. Int J Prosthodont 2002;15:28-37. Holm-Pedersen P, Loe H. Text book of geriatric dentistry. 2 nd ed. Blackwell Munksgaard: 1996.